Sometimes I throw something together quickly, just for that day. 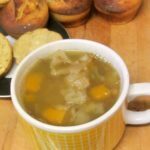 I use something like the turkey stock I have on hand this week – or the chicken stock I often have… and throw in some vegetables, maybe some leftover cooked meat. I’ve never really been much for noodles in soup, if they would have to stand – I think they’re too soggy, the next day – but I’m learning to use the Asian technique of just adding the cooked noodles to a bowl of soup, which helps with that problem. I may try doing the same with dumplings… see if I like them better when they’re not soggy! Often, though, I make one or another bean soup. We enjoy them, they are hearty, they are nutritious… and they’re very easy. The only issue is time. (I’m not starting to cook lunch first thing in the morning… I’m doing well to fix breakfast!) I may start with cooked beans, I may cook them overnight in the slow cooker, I may make it for dinner and have leftovers for lunch. Often, though, I just use either lentils or split peas, because they are fast. And, again, we like them. 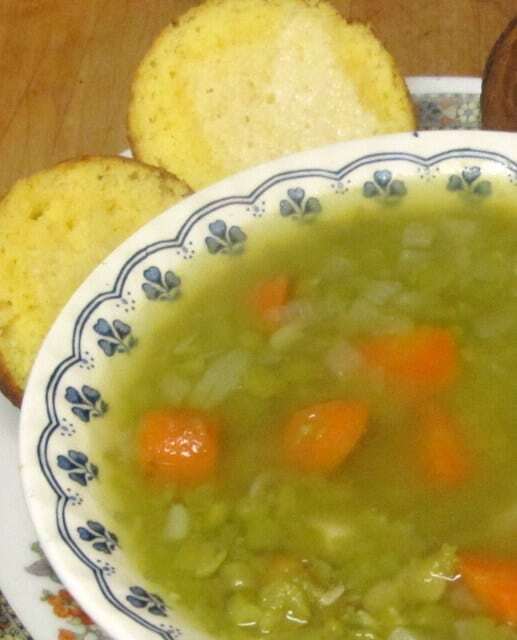 Last year I wrote up a good Split Pea with Ham recipe. Which is all very well if one has a ham bone… or likes ham in pea soup… or eats ham at all… I eat it and like it, but rarely have a ham bone – and of course, many people don’t like it or eat it at all. I really, much more often, make a vegetarian split pea soup, because I usually don’t have ham or pork to put in it, and it is faster and easier, and also delicious. Also – a note about salt in my cooking… I learned to cook just as my mother was going on a low sodium diet for high blood pressure – so I use very little salt in my cooking, expecting to add a sprinkle later if it is needed (since I might add some, and she would not.) And when I do add it, it’s usually just a pinch or a sprinkle. At the same time, Rich and I both actually have low blood pressure, and are supposed to make sure we do get enough salt… though his tastes are for very little, for the same reasons as mine… (We both take after our fathers, in this one.) So I will usually tell you to add helpful amounts like a Pinch, a Dash, a Sprinkle, or To Taste. I did recently read something complaining about telling you to salt to taste in food you cannot yet taste – and yes, that is an issue, especially for a beginning cook – but most experienced cooks do have an idea of how much they like. 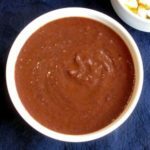 And the teaspoon (or even half teaspoon) many recipes call for is much too much for my taste… I strongly suspect that some of them say that simply because it’s an easy small measure – I don’t believe I’ve ever seen a typical home cook actually measure salt for soup or stew. 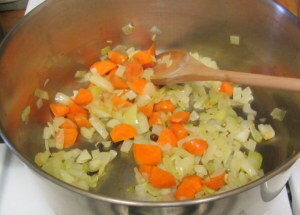 These are pretty much the basic vegetables – I almost always add onion and carrot, it’s too plain without them. Other aromatics or root vegetables can easily be added, if you have them – celery is particularly good, as are turnips or rutabaga. (Skip the beets… ) Parsnips add a sweetness that some like and others do not… see what you think. 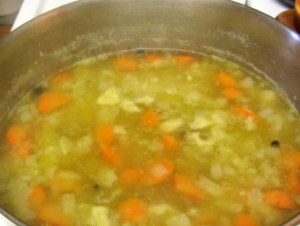 And if you’re in a rush, and you have already sauteed vegetables in your freezer (onion, leeks, celery, mirepoix…) you can skip this whole step and just throw them in the pot with the split peas and spices (and maybe another vegetable or two.) Varying the ingredients at this stage can give you just enough difference in the flavor so that you won’t be bored if you eat this often. Once the vegetables are sauteed, add the (rinsed and picked over) split peas. Stir them around in the pot to mix well with the little bit of now-flavored oil and spices, and then add 2 quarts of water, and that dash of salt. 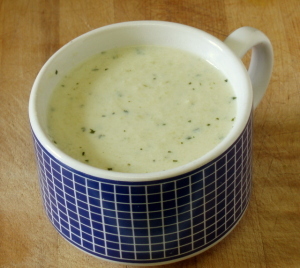 You can use broth instead, if you want, but the soup is really quite good without it – I keep the broth for other soups. Now – I just throw in the whole spices. They’re pretty easy to spot, and I’m used to using whole spices, so I often just leave them in – they’re no trouble for us. If, however, you are cooking for young children, or someone who might have a choking issue, or anyone who might just gulp without looking – or if you’d just like to not think about them while you are eating… they float pretty well and can be fished out at this point, as I did in this case. (Which is a reason to note exactly how many you put in, so you know how many you need to remove.) Or – especially in the first two scenarios – you could put them in a mesh teaball or tie them in cheesecloth, to be easy to pull out. Or you could just use ground spice and not have to think about it at all, especially if you tend to have ground rather than whole spices for baking. Anyhow – this made a nice sized soup pot – lunch for the two of us for two days. 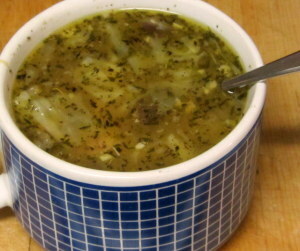 You could have more smaller servings – a cup of soup with a sandwich – as you please. 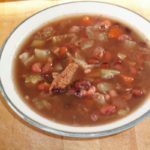 Like most bean soups, it is even a little better the next day – the flavors meld… We ate it with corn muffins, a bright, warm, comforting meal on a gray rainy day. 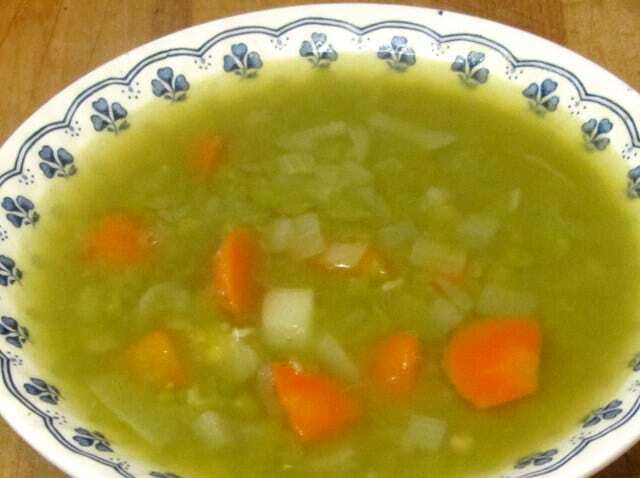 A simple vegetarian Split Pea Soup - when you don't have, or don't want to use, ham, but do want a warm soothing soup in an hour or so. 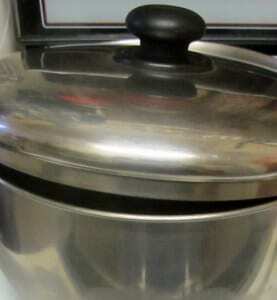 Heat oil in a soup pot. Add onion, carrot, and whole spices, Stir to coat with oil, and let cook until onion softens and starts to color. 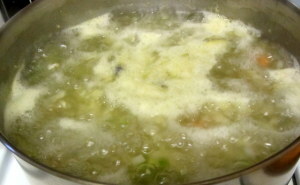 Add minced or crushed garlic. Stir. Add split peas (which have been washed and picked over.) Stir. Add 2 quarts of water, and salt. Bring to a boil, being careful not to let it boil over. Lower the heat, and set it to simmer. Cook for 1 hour, or until peas are soft and falling apart.